Paul III, given name Alessandro Farnese, Roman Catholic Pope from 1534 to 1549, Was born on the 28th of February 1468, of an old and distinguished family. As a pupil of the famous Pomponius Laetus, and, subsequently, as a member of the circle of Cosmo de Medici, he received a finished education. From Florence he passed to Rome, and became the father of at least two children, later legitimized. Upon entering the service of the Church, however, he lived more circumspectly. His advancement was rapid. To the liaison between his sister Giulia Farnese Orsini and Pope Alexander VI he owed his cardinal's hat; but the steady favor which he enjoyed under successive popes was due to his own cleverness and capacity for affairs. 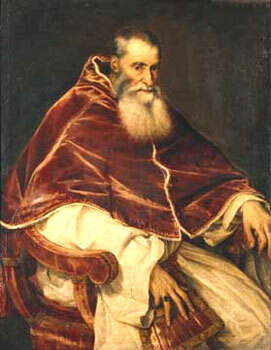 His election to the papacy, on the 13th of October 1534, to succeed Pope Clement VII, was virtually without opposition. The pontificate of Paul III forms a turning point in the history of the papacy. The situation at his accession was grave and complex: the steady growth of Protestantism, the preponderant power of the emperor and his prolonged wars with France, the advances of the Turks, the uncertain mind of the Church itself -- all conspired to produce a problem involved and delicate. Paul was shrewd, calculating, tenacious; but on the other hand over-cautious, and inclined rather to temporize than to strike at the critical moment. His instincts and ambitions were those of a secular prince of the Renaissance; but circumstances forced him to become the patron of reform. By the promotion to the cardinalate of such men as Contarini, Caraffa, Pole and Morone, and the appointment of a commission to report upon existing evils and their remedy, the way was opened for reform; while by the introduction of the Inquisition into Italy (1542), the establishment of the censorship and the Index (1543), and the approval of the Society of Jesus (1540), most efficient agencies were set on foot for combating heresy. But in the matter of a general council, so urgently desired by the emperor, Paul showed himself irresolute and procrastinating. Finally on the 13th of December 1545 the Council assembled in Trent; but when the victories of Charles V seemed to threaten its independence it was transferred to Bologna (March 1547) and not long afterwards suspended (September 1549). He concluded the truce of Nice (1538) between Charles and Francis, and contracted an alliance with each. But the peace of Crespy and the emperor's negotiations with the Protestants (1544) turned him against Charles, and he was suspected of desiring his defeat in the Schmalkaldic War. The most deplorable weakness of Paul was his nepotism. Parma and Piacenza, states of the Church, he bestowed upon his natural son Pier Luigi (1545). But in 1549 Pier Luigi was assassinated by his outraged subjects, and the emperor thereupon claimed the two duchies for his son-in-law Ottavio Farnese, Paul's grandson. This led to a family quarrel which greatly embittered the last days of the pope and hastened his death (November 10, 1549). Parma and Piacenza continued to be a bone of contention for two hundred and fifty years. Paul is gifted and cultured, a lover and patron of art. He began the famous Farnese Palace; constructed the Sala Regia in the Vatican; commissioned Michelangelo to paint the "Last Judgment", and to resume work upon St. Peter's; and otherwise adorned the city. Easygoing, luxurious, worldly-minded, Paul was not in full sympathy with the prevailing influences about him.